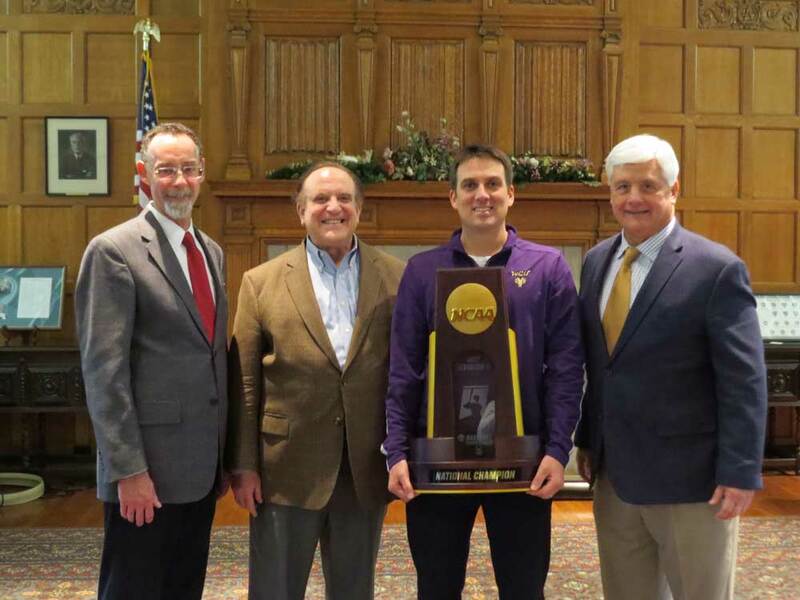 From left, West Chester University President Chris Fiorentino, state Sen. Andy Dinniman, Head Coach Jad Prachniak and state Sen. Robert Tomlinson. 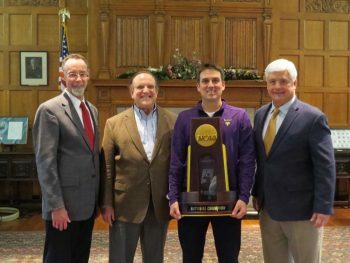 State Senators Andy Dinniman and Robert “Tommy” Tomlinson this week recognized the West Chester University Golden Rams baseball team winning the 2017 NCAA Division II National Championship –its second national championship in six years. “You did a monumental job and you made the entire community proud,” Dinniman said. Dinniman and Tomlinson met with team members, coaches, and Head Coach Jad Prachniak during a special ceremony at the university’s Phillips Autograph Library. West Chester University Director of Athletics Terrie Beattie, University President Chris Fiorentino, and Vice President for Student Affairs, Dr. Zebulun Davenport, were also on hand. The players and coaches were each presented a special Senate citation, sponsored by Dinniman and Tomlinson, in honor of the milestone achievement. Tomlinson, a West Chester University graduate and member of the West Chester University Board of Trustees, reflected on his own collegiate athletic career as captain of the Golden Rams Football Team in 1969. Tomlinson helped the team capture the state championship in 1967 and 1969 and he also played in the Tangerine Bowl in 1967. West Chester won the 2017 national championship with a 5-2 victory over UC San Diego in June in Grand Prairie, Texas. The team also won the national title in 2012 and appeared in the national championship game in 2006 and 2009. The Golden Rams are still the only school from the Commonwealth of Pennsylvania to win a baseball national championship at any level and the only institution from the northeastern part of the United States to win an NCAA baseball national title at the Division I or II levels.